Chocolate Cupcakes infused with Chai & Chocolate Spices, topped with a Chai infused Buttercream Frosting; Chocolate Chai Cupcakes are a whole new level of Flavour. Henny & Joe’s sent me the products and paid me to produce a blog post for them. Any views are my own, and have not been affected by this. I wanted to try something new on my blog, and something I wouldn’t usually choose myself. When I go to a coffee shop I will ALWAYS choose a Hot Chocolate, as I don’t drink Tea or Coffee, so I tend to stay away from anything Chai related. If I am being completely honest, I had no idea what ‘Chai’ really tasted like? Me being me, I assumed I didn’t like it. However, I now realise its not just “some tea or a fancy latte”, its a world of flavour. 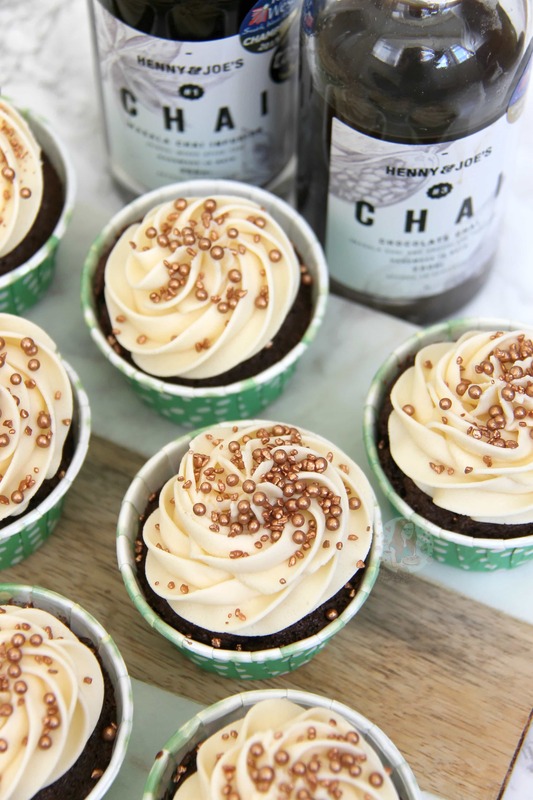 Henny & Joe’s is a company based near Bath, and they make a Chai and a Chocolate Chai infusion which you can make into Teas, or Lattes at your leisure. The Bottles I got sent contain apparently 15 servings, so its much better value then I first thought! And one extra bonus, its naturally free from Caffeine so yay for me! 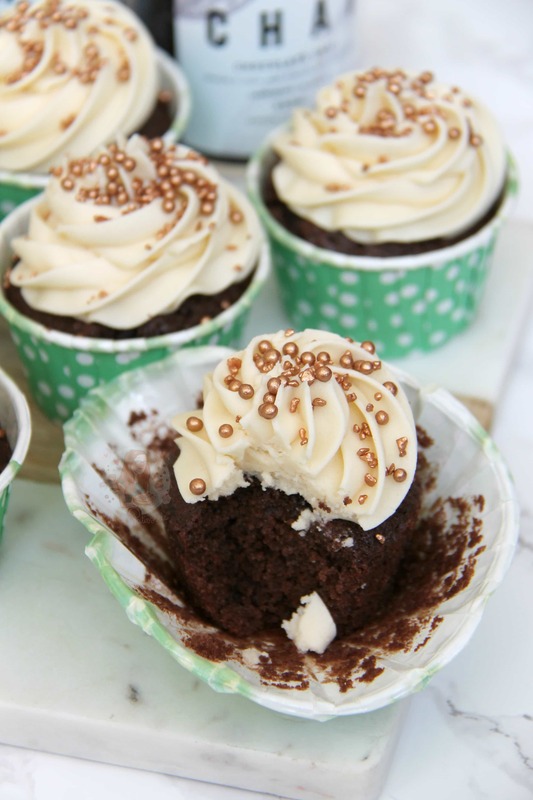 But anyway, as I am a baking blog, I wanted to make something using the infusions, so I went for cupcakes. I got sent both types of Infusion, but I wanted to try the Chocolate Chai one as I am obviously Chocolate obsessed. On Henny & Joe’s Website they give this blurb about their Chocolate Chai Infusion: “A contemporary twist on the classic masala chai. 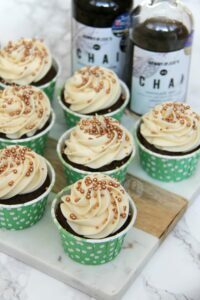 This chocolate chai is a blend of our multi-award winning masala chai with the most complimenting chocolate we could find. With the first sip you can expect all the beautiful spices (cardamom, ginger, star anise, nutmeg, cloves, all spice, mixed spice, fennel seed and cinnamon) followed by the chocolate taste on your lips.” Now I am not one to usually believe anything I read, but this is so true! The flavour travels around your mouth, and its DELICIOUS. I have tips below on how to achieve this recipe without needing the infusions (as I know not all of you will buy it!) and if you’re a fan of ‘Chai’ you can still enjoy it. Having a Chocolate Cupcake base mixed with the flavouring was so delicious, but I didn’t want to overload the cupcakes and make it too chocolatey, so I used a plain buttercream frosting, with the infusion added, to make something a little different. I used my usual Iced Jems Regular Baking Cups to bake mine in, and a 2D Closed Star Piping Tip to decorate! I hope you love these as I much as I did, especially considering I thought I wouldn’t like the flavours, it was DELICIOUS. Enjoy! 1) To make the Cupcakes – Heat your oven to 180C/160 Fan/350F and line a cupcake/muffin tin with 12 cases or put 12 Iced Jems Baking Cups onto a flat tray! 3) Add the Henny & Joes Chocolate Chai and beat again till smooth. 4) Bake in the oven for 15-20 minutes or until a skewer poked into one of the cakes comes out clean and they are springy to touch. Leave to cool fully on a cooling rack! 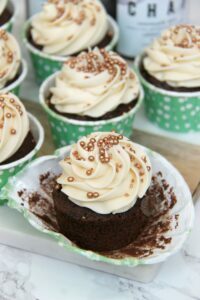 5) To make the Chocolate Chai Buttercream – Beat the butter with an electric mixer for a couple of minutes to loosen it – gradually beat in the icing sugar until well combined, then add the cocoa powder and beat for 5 minutes until a silky lovely buttercream texture is produced. Add in the Henny & Joes Chocolate Chai and beat again till smooth and delicious. 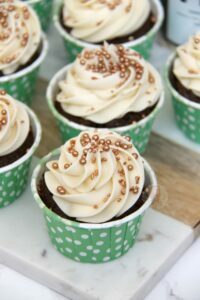 6) To decorate the Cupcakes – I used a 2D Closed Star Piping Tip to decorate my cakes but you can do whatever you like! 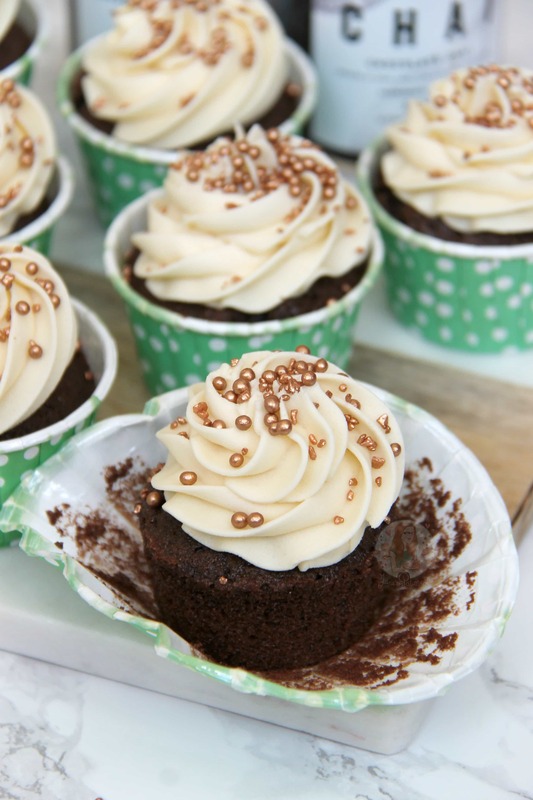 I pipe my cupcakes like an ice-cream at the beach looks so its the perfect ratio of buttercream to cake. 7) Once iced, sprinkle on some lovely little sprinkles and enjoy! I used a 2D Closed Star Piping Tip to decorate my cakes as they get the nice swirl! And some Iced Jems Baking Cups to bake with! These will last for 3 days in an airtight container! 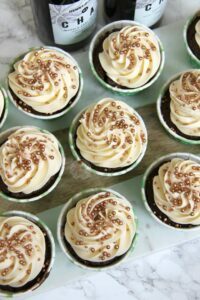 Find my other Cupcake Recipes on my Recipes Page! Older Next post: Raspberry and White Chocolate Mousse! Newer Previous post: Easter Brownies! Love the look of these! ..and I am always up for trying something new and experimenting!